I should probably start here with a clarification of the use of the word “kitty” as I’ll be using it a lot here, and in varying ways. Strictly speaking, most gamblers know a kitty as the money in “the pot,” the funds or stakes up for grabs in the game. This why you’ll often find those black cats in the center of vintage rummy game trays and mats. 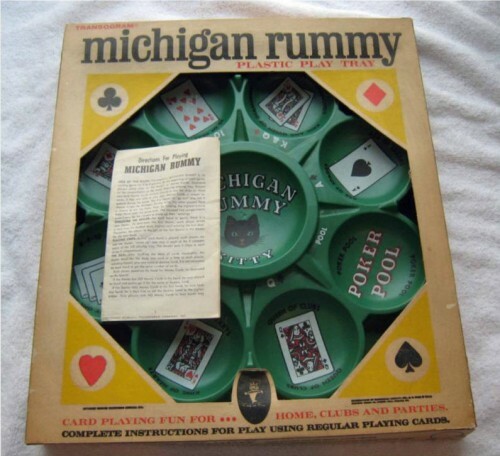 Vintage Rummy Game With Black Cat "Kitty"
But the word “kitty” is used in my circle of gaming girls to mean other things too. And housewives of yesteryear also managed to stash a little mad money for themselves too. This too was made up from the money they managed to save on regular household expenses, but it also included — GASP! — money she won in card games with the girls. 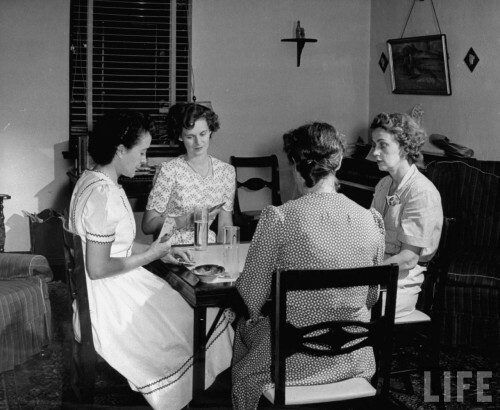 Card games, such as Bridge, Canasta and the myriad forms of Rummy, were not just the stuff atomic couples played; ladies played them too. And points and bragging rights weren’t the only things up for grabs. Often each point was a penny (or higher, depending on the circle), and ladies would make sure they had enough in their own secret stashes of cash to be able to play the weekly game. This money was often called a lady’s kitty. A woman kept a separate kitty for each game or circle of friends she was a part of. This was not only a practical matter of budgeting one’s money, but it was also deemed in poor taste to bring a billfold of dollar bills to a penny-a-point game. The more games a lady was part of, the more kitties she had. Each kitty was generally kept hidden at home; a coffee can on a pantry shelf, an envelope tucked into a drawer of dainties, a little jar in the closet, etc. But kitties were never carried about in such containers. Each kitty had a corresponding coin purse that went to the games. Not only would a jar or can be seen as poor manners, but a lady wouldn’t ever tip her hand by showing the depths of her pockets. (Or a lack thereof.) Gran says each woman’s little gambling kitty coin purse was like her calling card; you could immediately recognize who was at the game by the little coin purses laying at an empty table. Gran estimates that back in the day, she had as many as a dozen ongoing games – and kitty purses to match. In any case, I myself, and the girls in my gambling circles, have adopted the use of the term “kitty” to mean multiple things: a gambling pot, shared collections of money, our individual secret cash stashes, our little coin purses. It may seem confusing at the start, but I’m betting you’ll catch on quick enough. Vintage Michigan Rummy tray with black cat “kitty” pot via 1020mo. Suburban housewives playing a game of bridge; photographer, Alfred Eisenstaedt; LIFE 1942. This entry was posted in Dames, Games and tagged essentials, etiquette, history, save money for your kitty, terms, your kitty. Bookmark the permalink. 2 Responses to What’s A “Kitty”? Why So Many Of Them? GREAT POST!!! thanks. my aunts make these vintage bridge aprons http://www.etsy.com/listing/75032899/womens-apron-vintage-queen-of-hearts. Your post is so informative.